Garavani hosted an exclusive luncheon Wednesday in honor of Giancarlo Giammetti and his new autobiographical book, Private. The weighty, beautiful tome (out next week from Assouline) is filled with rare photographs, tidbits from Giammetti’s journals, interviews, and recollections from his life as personal and professional partner to the legendary designer Valentino. Anderson Cooper, Carolina Herrera, Barbara Walters, Tory Burch, and Victor Garber were among the New York City luminaries who joined Carter in toasting Giammetti at Monkey Bar. 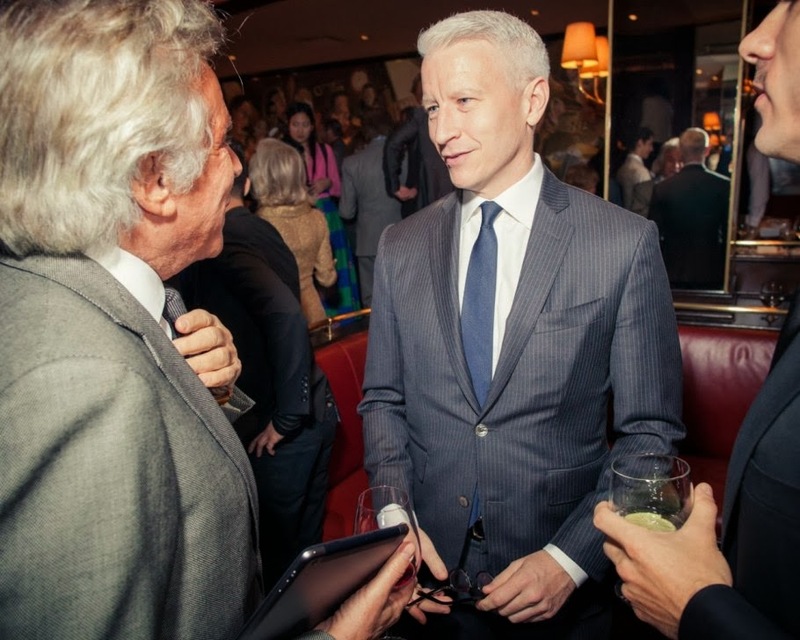 Today had expressed interest in Anderson Cooper for a role on the show. But Cooper, 46, is negotiating a new deal with CNN and will continue to anchor pieces for 60 Minutes, whose executives want him to do more. Happy to see Cornell Belcher back on 360 and Candy Crowley did a well-rounded report on Christie that wasn't just fawning nonsense. I was disappointed that there were no liberals on AC360 Later in the first segment on Chris Christie--when 360 has a segment on a liberal politician, they'll sometimes bring in TWO conservatives for the discussion. Not everyone is as enamored with Christie as the media seems to be and those voices should be heard. Hill Harper was a good addition to the show--the marijuana segment was pretty intense with a variety of opinions flying around--Sullivan is certainly a proponent of pot. I wasn't really interested in PJ O'Rourke, but at least he was someone new to the show. Alex Castellanos just did his usual schtick. I sort of wish they'd just drop the CNN contributors and just speak to people outside of the network. I'm kind of hoping AC's contract negotiations with CNN fall through because I'd rather watch him somewhere else. CNN has been leaning too much to the right of late for my money. Very nice pics of AC--especially love the street shot of AC and Ben looking slick and polished in their suits. 360 on Wednesday had some good moments. However, I drifted off to Hayes a few times. I liked Candy Crowley's report on re-elected Gov. Christie (R-NJ). The report pointed out his good points but also the bad - his brash personality and opposition to legal abortion and Planned Parenthood. Later, the panel was great in that it had one conservative, Ana Navarro, and one liberal, Cornell Belcher, and equal time for both to speak. To be perfectly honest and frankly shallow, what is with Navarro's voice? It's been a long time since I've heard her (I don't watch 360 Later). While it was tolerable at the start, the more Navarro spoke, the more she sounded like a cartoon character. Ms. Navarro, if you're reading this, invest the time and money in a voice therapist who can help you sound more professional. In Dan Lemon's profile of NYC Mayor-elect de Blasio, I loved the college-era photo of him. Kendrick Johnson death investigation again. It's very sad and my sympathies to the family but I still don't understand why this is getting so much time on 360. Does Anderson or a high-level 360 executive have connections to the family? I spent this segment watching Hayes. The segment on Toronto Mayer Rob Ford and his addictions might have been good; someone else will have to comment on it because I was involved in discussion here in my living room. Checking out Hayes during a 360 commercial break, I stayed there for his panel on married/single differences in voting instead of Gary Tuchman's crime and punishment report. The Ridiculist was amusing for the Ander-giggles. Personally I thought Miss USA's costume was far more ridiculous and laughable than the others. Thanks ATA, for the extra photos. Is that Anderson and Ben walking in the streets of New York instagram pic? I didn't think Ben was taller than Anderson? @anon 3:33 am, it is them. They were going to or coming from a Vanity Fair book party. VF has an article and pics online. @Jaanza, 'cartoonish' is the perfect description for Navarro's voice--I couldn't quite put my finger on what made it so strange but you have it right. Ok, I DID see the VF pics ATA already posted but I opened the comments and saw 3:33's question and answered forgetting that the pics were already here! I am so disappointed in AC360 Later and it was my last best hope for CNN. Two nights of no Dem on the panel and last night had even more Repubs than Tuesday night. I guess it's just an open secret now that CNN is really trying to be FOX news. Hill Harper made the most sense on the marijuana segment. He was speaking about the realities of legalization vs personal preferences. Andrew Sullivan needs to be gone for awhile or they need to change the name to The Andrew Sullivan show. I was really hoping AC360 Later would be full of fresh faces having a smart debate - not the same faces and topics as seen on AC360. Monday's program seemed to hold a lot of promise with discussion on racial profiling, but then the "shooter" at a NJ mall took up the hour and I'm guessing we won't see the planned program, because that's how fickle AC360 is and it's apparently the same staff on Later. Guess that explains why both programs are failing with viewers and ratings are showing the bleed. I hope Anderson's contract negotiations with CNN fall apart and he can find another outlet where he does reporting/storytelling instead of towing the new CNN company line and reading prompter.